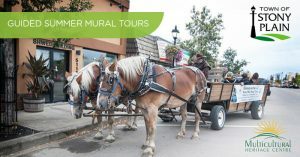 Bring your family to visit the Town with the Painted Past by taking a horse and wagon tour to see our historic murals of Stony Plain. Wagons seat up to 14 adults per trip. Tour times are 11-12:15 and 12:20-1:30 Cost $10/person plus G.S.T, Book early as tours book fast. Rained out days will be rescheduled. Cancel up to 24 hours prior for a full refund.